Crane, Stephen. Autograph manuscript of The Red Badge of Courage. 176 pages. Ca. 1894. From the Clifton Waller Barrett Library of American Literature. Late in the year 1893, twenty-one-year-old Stephen Crane spent ten nights writing a story of the Civil War, a pot-boiler intended for the newspaper. Crane wrote: "I deliberately started in to do a pot-boiler, something that would take the boarding-school element.... I got interested in the thing in spite of myself, and I couldn’t, I couldn’t. I had to do it my own way." He finished the novel early the next year. Though only his second novel, The Red Badge of Courage established Crane’s reputation in critical and literary circles. The novel contrasts the harsh realities of battle with the conventional heroic narrative. Since he never served in the Civil War, he researched exhaustively on the subject by reading many of the personal accounts that were available at the time. According to his friend Corwin Linson: "He was squatting like an Indian among the magazines when he gave one a toss of exhaustive patience and stood up. 'I wonder that some of these fellows don’t tell how they felt in those scraps! They spout eternally of what they did, but they are emotionless as rocks!'" "I do not remember that he ever erased or changed anything. His writing was clean and round with a ring around his periods. He wrote slowly. It amazed me how he could keep the story in mind while he was slowly forming the letters." This manuscript of The Red Badge of Courage is the most comprehensive in existence. In preparation for publication, the story was subject to considerable emendations and deletions which are reflected in the manuscript. Walt Whitman. 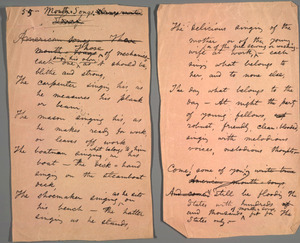 Leaves of Grass, autograph manuscript of eighty-two separate poems from the third edition published in 1860. From the Clifton Waller Barrett Library of American Literature. 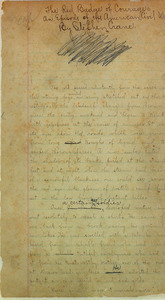 According to Fredson Bowers in his book Whitman’s Manuscripts: Leaves of Grass (1860), this manuscript represents "the largest single accumulation in existence of Whitman’s holograph verse." It is the only known surviving manuscript of the many published editions of Leaves of Grass. Shown here is the draft of the poem that evolved into the famous "I hear America singing." The carpenter singing his as he measures his plank or beam,...."
Frost, Robert. Twilight. Lawrence, Mass. : 1894. Only known copy of Frost’s first book, privately printed by the poet. 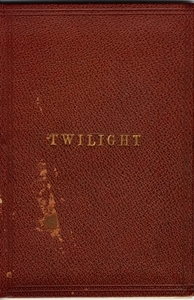 According to Frost’s presentation inscription to Earl J. Bernheimer, dated February 1, 1940, only two copies were printed and the other one destroyed. 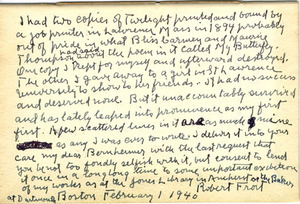 According to Frost, it contained a contemporary inscription from him to Elinor White. In addition to the inscriptions, two telegrams concerning the transfer of the book to Bernheimer are laid in. The book also contains a second inscription, "Sixty years later signed over to my friend R. V. Thornton at Chicago. Robert Frost." Cather, Willa. 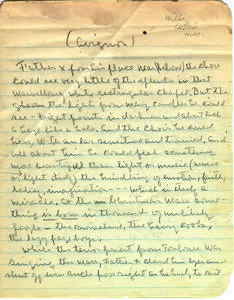 Autograph manuscript of “Avignon,” fragment from Willa Cather’s last unpublished novel Hard Punishments. Ca. 1946. Three years before her death in 1947, Willa Cather began work on a long novella about 14th-century Avignon and its palatial papal residence at the time of Benedict XII. Willa Cather first visited the great palace of the anti-popes overlooking the Rhone in 1902. The atmosphere of the place made a strong impression on her that deepened with other visits to Provence in later years. Her unfinished Avignon story was to be a radical departure from her previous work. She was famous for showing American readers the hard and beautiful life on the American great plains, but her last story was set entirely in the south of France. In the latter part of her life, Cather felt increasingly drawn to Europe because she felt her beloved Nebraska was becoming industrialized and materialistic. In her last years, a chronic condition effecting her right hand made the physical act of writing painful; so work on the novel progressed sporadically. At her death, she had only completed a draft of the first half of the novel, and had the last half only in the form of notes. Cather habitually destroyed all preliminary matter connected with her publications as soon as the work was available in book form. When her powers began to fail in 1946, she made stringent arrangements that all letters, manuscript material and unpublished work be destroyed after her death. Her literary executors carried out these instructions with conscientious thoroughness. Miraculously, though, one fragment somehow survived: three and one-half pages of rough draft in her hand, torn from a composition book— clearly a passage from Hard Punishments, the Avignon novel. We do not know how these pages escaped destruction; perhaps one of Cather’s literary executors spared the passage because of its beauty.